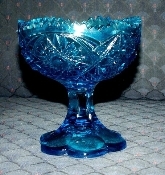 Vintage From Paul is delighted to offer this sparkling Kemple Wheaton Blue Toltec Footed Pedestal Candy Bowl. Beautiful Blue Footed Pedestal Candy Bowl in the pattern in called No 70 Toltec and the mold was originally a McKee mold that was sold to Kemple then later sold to Wheaton. The bottom of this Kemple Wheaton Blue Toltec Footed Pedestal Candy Bowl has the K for Kemple with a W under the K. The foot of the candy bowl is formed by 6 petals which rise to form the stem. The top of the bowl was the saw tooth edge. The bowl stands 4-7/8 inches in height, measures 4-5/8 inches in diameter at the top, 3-1/2 inches in diameter at the base. The Kemple Wheaton Blue Toltec Footed Pedestal Candy Bowl is in excellent condition with no nicks, chips or cracks. On the bottom you will find the K with a W under the K mark. It is a beautiful candlestick that would look great on any table. . The “Tec” patterns, as they have come to be known, are a line of 18 patterns all named with the suffix tec. The most well-known and popular of these patterns is the Aztec pattern. Nortec, another well-known “tec” pattern is often known by the popular name Centipede. McKee Glass Company began its life as McKee and Brothers Glass Works in Pittsburgh, PA in 1853. The factory later moved to Jeannette, PA, which was founded by H. Sellers McKee and named for his wife. In 1901, the National Glass Company took over the factory and ran it as McKee Glass until 1904. In 1904, National leased the factory to McKee-Jeannette Glass Company. It is this company that launched the patterns we now call the “tec” patterns. In 1904, McKee was granted a patent for the Pres-Cut trademark. The trademark was used on pressed glassware that imitated the fine cut glass of the time. McKee introduced its new line with two patterns that had already been part of the line under National — Aztec and Toltec. This new marketing approach was very successful as the line quickly gained popularity. Later that same year McKee added another former National pattern to the Pres-Cut line — Nortec. Fentec, the first McKee-designed pattern, was the next to be added. It also turned out to be the longest produced “Tec” pattern. Fentec can be seen in McKee catalogs as late as 1942. Two more patterns, Sextec and Bontec, were introduced in 1906. The introduction of new “Tec” patterns slowed down in the years between 1908 and 1912, as the company once again reorganized, becoming the McKee Glass Company in 1908. While new Pres-Cut patterns were added during this time, only Yutec was named using the “Tec” suffix. 1913 brought new activity to the “Tec” line. Between 1913 and 1915, eleven more patterns were added to the line: Bontec, Glentec, Carltec, Doltec, Plytec, Plutec, Quintec, Rotec, Startec, Valtec, and Wiltec.